Specifically selected to include a dazzling array of vibrant colours, along with the best performing varieties in recent scent trials. In June, strong arching stems hold sprays of up to ten large tubular flowers, perfect for planting 'en masse' in borders or containers. 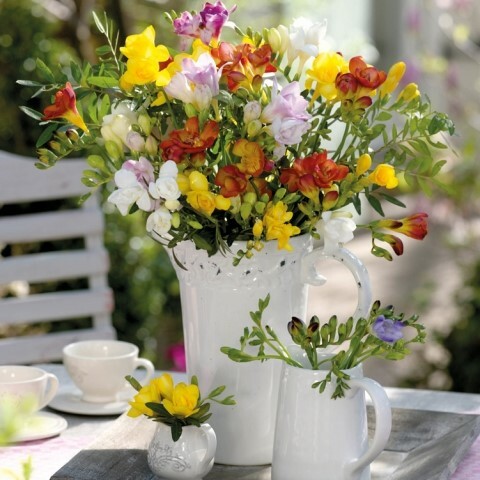 Very popular with florists as cut blooms last around three weeks in a vase. Additional Information - Bulbs can be planted about 5cm deep, in fertile, well drained soil. Plant the pointy end of the Freesias facing up. Leave foliage on after flowering until it becomes brown, then it can then be cleared. Stunning as a cut flower, lasting well in a vase. Scented. Each bulb usually produces two stems, each carrying 8-10 flowers. Half hardy perennial, lift to overwinter.